This candid image of two sisters walking through a field of flowers, picking perfect tulips is beautiful, even without the girls looking at the camera. Springtime… Days are warmer, longer and filled with the sights and sounds of nature’s rebirth, from flowers blooming in vibrant colors to the chirps of baby birds and other animals making themselves known. Everyone’s restless from spending winter indoors so it’s a great time to go outside and an even better opportunity to make great photos. 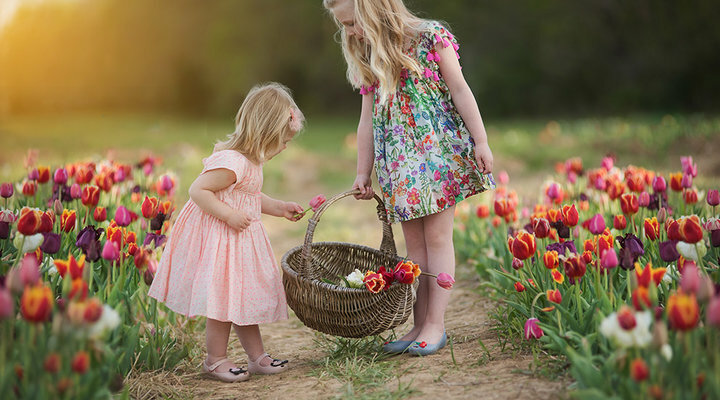 However, if you're taking pictures in your own garden, or somewhere you know its ok to let your little ones pick flowers, give your child a basket to put newly picked flowers into and follow her around as she selects the precious blooms. You can zoom in for tight shots, or fill the frame with the wonderful colorful flowers. Get down low on her level instead of shooting from your height pointing downwards. And a great portrait doesn't always have to have the subject smiling at the camera—or even looking at the camera either. Candid photos, where you capture your subject doing something naturally can be more timeless and express more feeling to the viewer. When taking a portrait of your youngster looking at the camera you can use a shallow depth of field to separate her from the busy background of flowers. To take a portrait using a shallow depth of field, place the camera on aperture priority and select the widest aperture your lens offers. For some lenses, it will be f/1.8 or f/2.8. For other lenses it may be f/3.5 or f/4. Flowers in the background will blur softly, giving more prominence to your subject. By using a wide-open aperture such as f/2.8, the background blurs into softness, with the flowers becoming soft pops of color, for a beautiful portrait. To see more of Kathy's photos visit her website: www.kathywolfephotography.com.